Can I Get Fit Over 40? Yes! You can Get Fit Over 40. 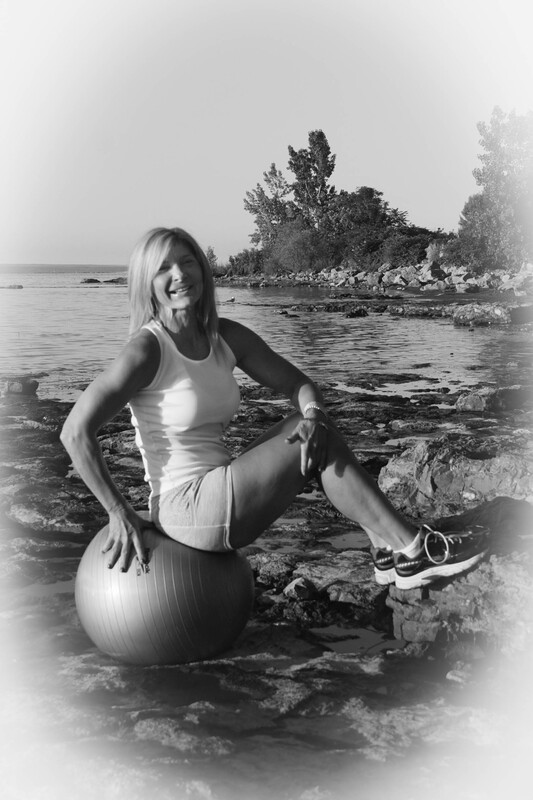 I’m Karen Pilote, Personal Trainer and I GOT FIT OVER 40, and so can you! You can improve physical conditions that limit your ability to be active. You can manage issues that hold you back. You can improve injuries and strengthen your body. You can lose weight and you can shape your physique. #1 Believe you can, decide you will and don’t ever give up. #2 Get on a plan. Belief and a plan are not important, they’re vital. You need to follow a realistic course of action that will lead you to your goal. A plan will give you structure and accountability. A plan will allow you to determine what works for you and what does not. And belief in that plan will give you power and assurance. When you follow a plan you can expect a certain outcome. If your efforts don’t yield the desired outcomes, you will be better able to revise the plan, tweak the process and move forward towards your goals. There is no way to fail unless you give up. -Educate yourself. Learn the basics about training and nutrition. -Eat for nutrition. Don’t diet. Eat wholesome, real food most of the time. -Train for performance, not fat loss. -Limit excessive cardio. Follow a balanced and progressive training program. -Set an ultimate goal and a realistic time frame. Break your training into 4-6 week cycles that will lead to the overall goal. When you think about starting on a fat loss journey, you may associate it with deprivation, hunger and long arduous workouts. That’s just not the case. Actually, fat loss is impossible under those circumstances, and that’s the good news. Believe you can achieve success, follow a sound training program, accept setbacks (learn from them) and never quit. You may not get this right away, but you will come to understand that getting fit over 40 is easier than at any other age. You have more control over your choices, your time, your finances and your habits. It will take some planning, but that’s where The Action Plan will help. The ACTION PLAN is a progressive fat loss and body shaping program based on sound exercise principles and a supportive nutrition plan. To lose fat, lose weight and change your physique you must exercise and eat well. Exercise is effective for weight loss, especially when you combine weight training and cardio training with an effective nutrition plan. This program organizes all the components that you need to achieve your goal; all you have to do is DO IT. On the Action Plan you will move relatively heavy weights and/or body weight, quickly. Following the plan, you will get to this point safely, without risking injury. Start with lighter weights and slow, controlled movements. Over a matter of several weeks, you will become stronger and naturally able to increase the weight you lift and speed at which its lifted. You will adapt. You will incorporate several different modes of training over the next 3 months. Each session targets a specific component of fitness training that is required for overall fitness and sustainable weight loss. The Action Plan includes 10 basic multi-joint exercises that will engage a lot of muscles at one time. Training like this will burn calories, and you will develop a lean, strong body. The risk of injury should be significantly lower using complex (multi-joint) exercises. Various muscle groups work together to execute the movements, creating patterns that promote safety and that work in developing a functional and fit body. These sessions are incorporated at the outset in an effort to encourage you to set aside time everyday for training. As you progress through the plan, walk sessions provide an active recovery time. High Intensity Interval Training is cardio done at a higher intensity for a shorter period of time. This method of training will not only help you maintain your muscle, but can help you build muscle mass. Maintaining and/or building muscle is critical for weight loss. With HIIT programs, the intensity bursts are tough and challenging, but they are short in duration. Walk/jog/lunge/sprint intervals will address muscle strengthening, endurance and fat burning goals. You will burn more fat and calories in a short time by alternating periods of intense effort with periods of moderate to low effort. Depending upon your current level of fitness, you may need to modify the number of workouts that are outlined in this progressive program. 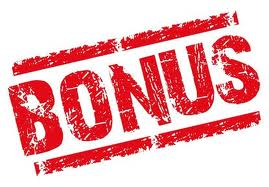 Use the bonus sessions too, if you feel you need more work along the way. Eating well is a major part of getting in shape. You cannot train every day and see results if you have a bad diet. You need to have both your nutrition and workouts in balance. Use our delicious recipes and sample menus to help get started, or devise your own meals based on the calorie and macro nutrient information available in the plan. Get Started Now! Instant Download! Download THE ACTION PLAN today and start now. Feel in control and be assured success. The Action Plan works when you commit. Believe then be fit. It’s your time now, let’s get started! Hi! Super excited to find your page! How do I know that the Action Plan will challenge my fitness level? 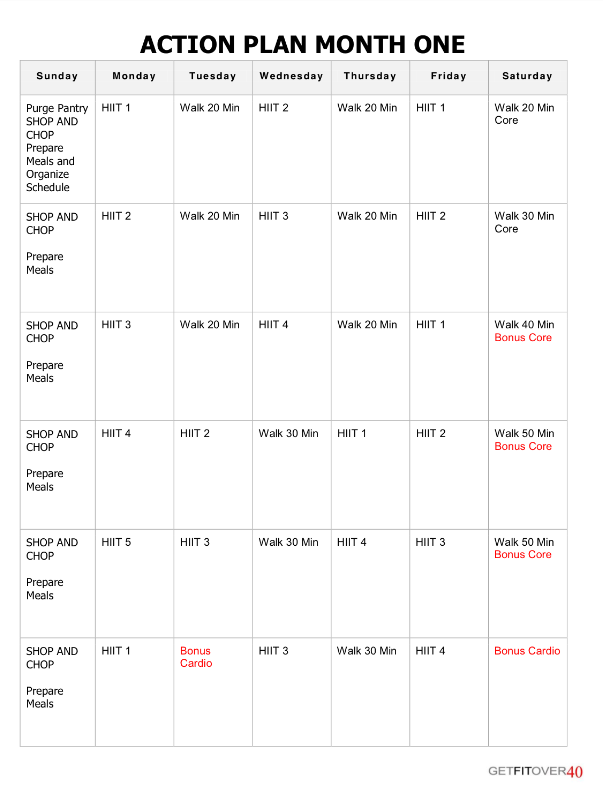 The 18 week plan instant download is 49.99 derika. You can also get the hardcopy for the added cost of shipping. Hello! Is this plan good for someone with injuries? I have a tear in the cartilage in my wrist, bursitis in the shoulder, a disc bulge on the spine along with tears and disc degenerative disease, and tears in the knee. I as well have desensitization which has flare ups of muscle weakness on the right side of my body. I tried the gym for 3 months and aquaspinning and I often left crying of pain . As for nutrition are the suggestions good for someone with IBS, lactose and sorbitol intolerance? Wow Christina, that is one heck of a list! The Action Plan is a good plan for someone with injuries and common sense. Any program you undertake will be difficult; you will have to modify most exercises and record your physical response daily. The Action Plan is a guided program rather than a diet and exercises “set in stone.” The key to success is following the pre-planned progression as best you can and at your pace with respect to your limitations. You will have to listen to your body and give it time to recuperate, push it to the pain threshold but not beyond, and eat with the intent of nourishing, strengthening and healing. The progression of exercise intensity, frequency and duration will be slower for a person with injuries as you will pause often at points throughout the weeks to learn and implement unique ways to prompt your body into strengthening, adapting and overcoming the injuries. Food choices will be critical because you will need to provide sufficient nutrition to support daily functions as well as healing considerations. I don’t exercise regularly, but do enjoy it once I get going. My biggest problem is diet – just can’t tolerate many vegetables. I try them over and over and they still make me sick especially mushrooms, asparagus, cabbage, Brussel sprouts, and especially BEETS. Is there any way to do this if you est the same few veggies over and over? Of course Kim, the key to staying consistent with good eating habits is to find the foods that you enjoy and incorporate them into your diet. You can get a good variety of nutrients from a select few vegetables, but I would work to alternate them to keep things interesting and enjoyable. Don’t confine yourself to dietary rules, instead, aim to eat intuitively and find what works best for you! What modifications would you suggest for the over sixty? I’m dairy (not lactose) and wheat (not gluten) intolerant. Does your eating plan have suitable recipes? Question do you have to follow the Shrink part of the program to be successful? Because I have low blood sugar and I need to have healthy carbs like a sweet potato or brown rice? Does your plan work for the morbidly obese? I am 46 and I weigh 270 pounds. I don’t want to do surgery because I don’t want saggy skin but I want to be healthy but working out hurts. Hi Theresa: Did you start the program? I am at 250 and wanted to get your perspective. Is there a Kindle version of the book? Yes, The Action Plan digital download opens in Kindle. Perfect for the workouts and the recipes; the plan moves easily from the gym to the kitchen and to the grocery store……thanks for inquiring K. Have a great weekend! Greetings from Dallas, Tx! Is this program good for a beginner? What if I cannot complete a HIIT workout? Do I do as many reps as I can or do I do them all even if I must take a break? Also, can I do more than one round of this? We’re going on our honeymoon finally in August. Hiya Zandi! Yes the program is appropriate for a beginner with the intention of starting where you are and progressing at your own rate. 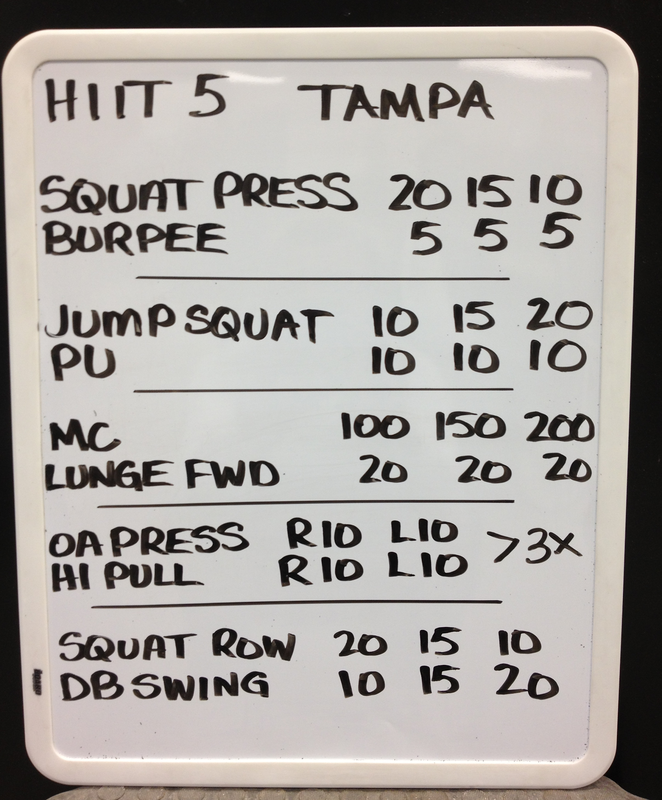 I would suggest getting into the habit of sticking to the schedule as best as possible and modifying each HIIT board. Do less sets, do less reps or do less weight…..whatever feels right and challenging. Decide on your personal goal for that day, for that board and work to achieve it. You will grow stronger and more confident within days, and then you will know what is reasonable to expect from yourself. You can do the program more than once, by the time you complete 3 months you will be well able to decide what workouts to do on what day, you might even be doubling up on some by then. I also post random workouts on the facebook page that you could incorporate. Once The Action Plan is completed, you will have a good grasp of what it takes to achieve your goals………and you should be in fantastic shape for your honeymoon! Congratulations! Hi, I am sixty-seven years old, and I have never been into exercise. My generation of women was told that it was “un-ladylike.” Consequently, because I also eat a lot, I am considerably overweight: 235 pounds at 5’4″. And when I sweat, it’s so awful . . . I sweat buckets! Would I be able to undertake this program with some chance of success? Other than my weight and flabby muscles, I am pretty healthy. No heart disease, diabetes, etc. I do, however, struggle with depression and take medication for that which makes it more difficult for me to lose weight. Still, I think the exercise might help fight the depression. I watched my daughter (38 years old) and my daughter-in-law (in early 40s) completely change their bodies because of working out . . . and I want to do the same thing (at least as far as possible). Is this just a dream at my age? I know that if I don’t get moving soon, I soon won’t be able to move at all! I also have a job where I sit at a desk for 8 hours a day. I would like to have a reasonable idea of my chance of some success before I invest any money in the plan as, like most older single women, I am on a limited income. Thanks in advance for your reply. The manual itself will be out of print until September 2014, I have a copy reserved for you now. I will do my best to address technical questions for you whenever possible. Facebook pages The Action Plan and Get Fit Over 40 provide daily motivation. A weekly newsletter is delivered Friday afternoons. Hi Katherine, if you purchase the e-book download (49.99) and send me your address via email to karen@getfitover40.tv I will send you the manuscript. Sounds great Katherine, you are owning your workout! Make it yours. The hash marks are rounds, and you add an exercise each round. (Round 1 – press) (Round 2 press + squat) (Round 3 press + squat + high pull) (Round 4 press + squat + push up) Honestly, you can format this workout anyway you’d like at the outset and get results just by doing. You should decide how to proceed to week 3 when you get closer to that time. You may opt to stay with the Tree and the Fifty, but don’t get bored or let your body adapt too much. Variety is key for many reasons. I am so glad that you are eating well! You will have great stamina from good quality nutrients and calorie maneuverability when plateaus hit, and they will! I am really proud of you my friend! I should have said the above modifications are for a woman of 67 who has never exercised. *individual modifications are encouraged for every body, 37-47-57-67! You rock Katherine! Do you have a website? Do you have any stories you can share from people who have used your plan? “How did I find GFO 40 on Facebook? Friend of a friend? Who cares? The fact is – I found it and I LOVE IT. I started to follow GFO 40 by reading it daily on Facebook for motivation and inspiration. Then I read a story about Karen. She was 50 years young and competing in a figure competition. Wow! What an awesome and inspiring lady. At the end of October, I read about this Action Plan. I work out with a personal trainer 3x a week. I do my cardio, but I was getting bored and didn’t feel like I had been seeing results lately. I emailed Karen to get more information about the program and what was involved. She promptly responded and let me know that it would be challenging and would certainly “shake up” my routine. This seemed to me to be a great investment in my health – 18 weeks for less than the cost of what many people spend on their fancy coffee in one week! I’m a busy mother, wife and attorney; I am NOT a personal trainer. I don’t have time to plan out my workouts to continue progressing and seeing results. When the going gets tough, I hop on the treadmill and walk uphill or run a few miles. I sometimes do HIIT by adjusting the speed on the treadmill. Yes, I get Oxygen magazine and read the workouts, but will I try mountain climbers and burpees on my own in the privacy of my home? No. So what did I get from GFO 40 with the Action Plan? A great progressive workout program! I wake up in the morning, have a workout designed for me, and know what I need to do. And then I do it! One day it may be a HIIT program, another day a core workout, a treadmill program, or a walking program. Each program is designed to challenge me as I get progressively stronger and build endurance. What did I like about the Action Plan? First, it was so well organized. Each day for 18 weeks, I had a workout planned. I knew what I had to do. I spent 30 minutes in the morning doing my workout and I KNEW I was going to have a great day! The workouts were efficient and effective. They are just what a busy working person needs. The HIIT program was a cardio program with weights. It wasn’t boring. You progress at your own level. Yes, mountain climbers were difficult and so were jump squats – actually, I didn’t even know what they were at first – but Karen provides a demonstration video for each workout. That was pretty fantastic, like having my own personal trainer! When I started I could only do 10 or 20 mountain climbers at a time, but as I continued to do them and train my body, soon I could do 100! Hooray! Yes, I walked before the program, but would I walk and then do travelling lunges? No. Do I now? Yes, and I can feel my body getting stronger each time! Nutrition is a BIG part of getting in shape. You CANNOT workout or train every day and see results if you have a bad diet. You need to have both your nutrition and workouts in balance, and that’s just what I got with the action plan. Delicious meals and sample menus were provided to help me get started. Did I see changes? Absolutely! But I am not satisfied. I want to be the BEST that I can be. I want to continue to progress and variety is key in my workouts and I know that these workouts will continue to challenge my body and since my workouts are NOT boring, I keep coming back. hi.. am Ganesh Kudva .aged 47 years.. I am actually aFit person.. but suddenly I developed umbilical hernia .. had a surgery.. will I be able to regain my fitness.. I have been diagnosed with osteoarthritis and am very overwieight, so before I purchase the action plan are there modifications included that will help me with my limited abilities (meaning very bad knees and ankles)? Thank you for your time. How do I purchase the hard copy action plan? Hi Andrea- The Action Plan is currently available as an ebook download- it would be really easy to print out the book! Trying to purchase the Action Plan but says it’s $49.99 – not $39.99 when I add it to my cart?